If you are a parent of a child in the Fargo Public School (FPS) system, like I am, chances are you send your son or daughter off every morning with little or no thought about what they are going to do for lunch that day. We know they will eat, because we paid for lunch for the semester, or made arrangements to make sure their bellies are full, and they can concentrate on learning. But how much thought do we as parents give to the who, what, where, when, and how it all happens? “Not much,” was my answer. It just happens, right? Like our favorite cereal at the grocery store – school lunch is just sort of there. Obviously, there is more to it than that, so I went to FPS’s Central Kitchen to visit with Dave Rice and Cindy Hogenson to find some answers to those questions. Central Kitchen, which was just completed in August of 2017, is located at on 40th Avenue South, just west of I-29. From the outside, it doesn’t look like anything special, but inside is nothing short of impressive. The staff, equipment, layout, and management all work together like a well-oiled machine. Every morning at 4:30, the lights are on and the day begins. By 6:30 a.m., breakfast is on its way with lunch following shortly after. Prepping for the next day and cleanup all has to happen before the lights are out again at 5 p.m.
Rice is Operations Manager and has been with FPS for nearly 35 years. He had a hand in designing the layout of the Central Kitchen. The plan was to create a building that would be efficient for staff to do their work and reduce risk for foodborne illness, and every inch of the 5,500 square foot building was designed to carry out that plan. Central Kitchen was built so there is no worry of conflicting schedules or tasks. Shipments in are delivered on the east end and meals ship out on the west. The operations inside are also split by what Rice refers to as, “the Interstate,” a long, one-way path from east to west that keeps products moving in the same direction and limits two-way traffic. On either side of the Interstate are the cooking and dishwashing operations. Keeping food out of that danger zone and fighting the possibility of foodborne illness is always top-of-mind at FPS. 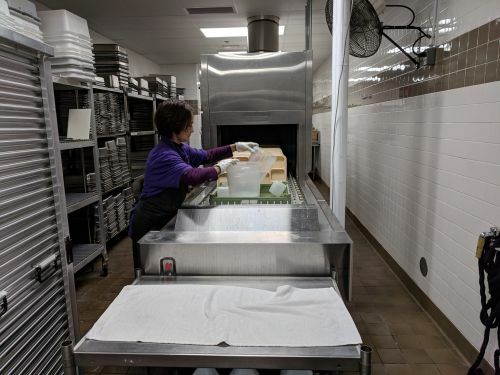 Another tool they use is the “fail-safe tray.” Every day, FPS staff collect one tray full of the different meals they serve – elementary, middle, and high school – and freeze it for a week. This is done to ensure that if there is a product served that caused an illness, FPS can determine exactly what it was. Rice says foodborne illness takes 24-48 hours to set in, so if a meal was served on Monday, Central Kitchen wouldn’t know about it until Wednesday or Thursday. If not for the fail-safe tray, the food would be in the garbage and long gone. “The sooner you can find the source of a potential outbreak, the more efficient you are at preventing it from spreading further,” says Hogenson, Nutrition Services Director. Thankfully, they have never had to test any of the trays. Speaking of trays, 11,000 lunches equates to a lot of trays and other kitchen supplies. 30 percent of Central Kitchen staff is dedicated to washing dishes. And the dishwashing operation is a sight to see. 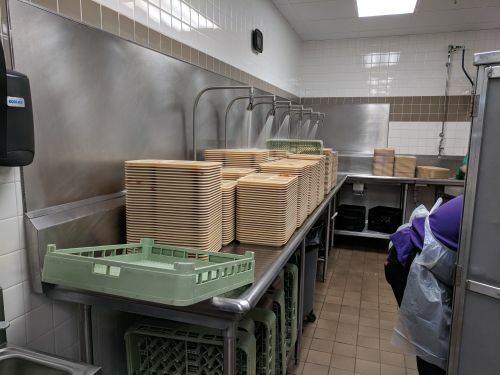 Every afternoon, the route drivers bring the trays back from the different schools and wheel them into the dish-washing area in carts that stand nearly five feet tall. They get unloaded onto a stainless-steel counter that has a lip to prevent water overflowing onto the floor. Above the counter are seven spouts that look like shower heads to spray down on the trays and give them a pre-soak. From the counter, they move to a sink where they are doused with more water while they are scrubbed. After the scrubbing, the trays go into a sanitizing machine. The machine looks like a combination of a much larger version of your dishwasher tray at home running through a pizza oven. The temperature inside gets up over 190 degrees, a temp Rice says is needed to heat the trays up to around 160 degrees to make sure they are properly sanitized. 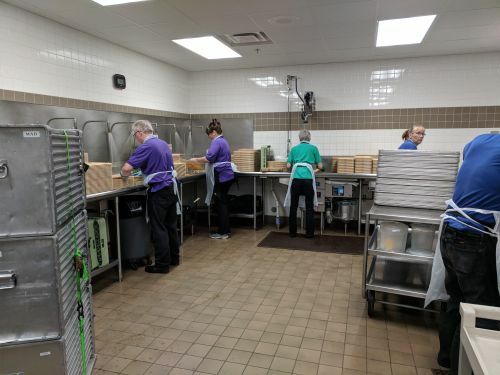 From start to finish, cleaning 11,000 trays at Central Kitchen takes around 45 minutes. This is impressive when you consider there are only about five to seven dishwashers working during the tray rush. This article barely scrapes the surface of everything going on at Central Kitchen. Nutrition, funding, menu planning, and maintenance also happen there. If you ever had any doubt about the care and dedication the team feeding our students has to them, take it from this parent – they are in the best hands they could be in.